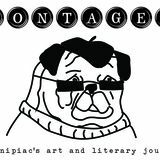 Montage is a student-run organization that celebrates the students that are creating amazing writing and visual pieces. 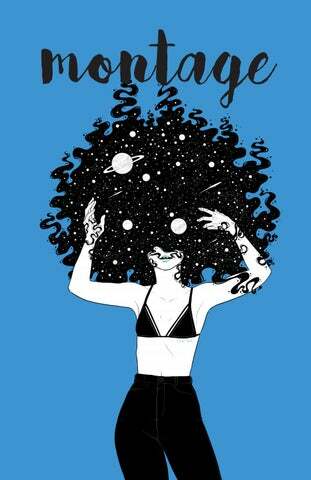 We are a group who promotes the growth of emerging writers and artists. We want content that pushes boundaries, is different, and is inspiring. We host literary events, workshops, and put out publications. Our aim is to be a platform to give students a creative support system and to continue creating. Thank you to our content panel that hand picked these pieces for our publication. See their names on the back. A NOTE FROM THE EDITOR Thank you for picking up our visual publication! Montage is so happy to be able to expand on the types of publications we are producing. Seeing this whole thing come to fruition makes me feel so proud to be able to facilitate this publication, especially since it was a new direction we were going in. The members on the content panel put in so much work picking the pieces that were going into this publication and Joelle, our designer, spent a lot of time organizing how the pieces were going to be ordered. She created a stunning layout for the visual pieces to be surrounded by. Thank you to everyone that submitted, that continues picking up our publication, and everyone that comes to our Open Mic series. Thank you for keeping the arts alive here at Quinnipiac, it creates a wonderful community, and Iâ&#x20AC;&#x2122;m so unbelievable happy and proud to be a part of this community. This is the FIRST EVER Coffee Table Book of just visuals Montage has produced!